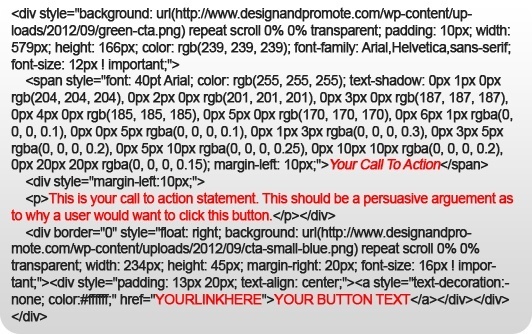 The difference between a functional landing page and a non functional landing page can be as simple as having a call-to-action graphic and not. Your users should have instruction on what to do next, and the implementation of a call-to-action graphic can monitor the page’s success as well as direct users to contacting you, downloading a free product or simply exchanging their information for something that you are offering. We’ve put together some free call to action graphics for you to use on your own website. To use one of these images on your website, simply right click the image, and select “Save Image As…” Save it onto your computer then re-upload it to your site and add your link! To implement one of our templates, simply scroll down this page to the template that you like, select the code displaying below it, paste it into your html editor on your website, and replace the highlighted text in the example below with the proper information. This is your call to action statement. This should be a persuasive arguement as to why a user would want to click this button.